I never liked tomatoes while growing up. I’m not sure what it was about them, but I just didn’t like them. My mother never really cooked with them, aside from their inclusion in her beloved chili recipe; but that was in paste form, and you couldn’t exactly taste them, so it was okay. Thinking back, it’s perhaps obvious why I never liked them, considering where I was most often exposed to them: squished between meat and bun on fast food sandwiches. It feels like a public airing of dirty family laundry to admit it. Yes, as a child, I most often saw tomatoes on my plate (as it were) at Rally’s. No wonder I picked the sad things off, pinching each one with the tiniest edge of fingertips, avoiding as much contact as possible. I eventually tired of constantly dealing with the poor things (that’s what I get for making a special order at a fast food restaurant), and would deign to eat them more and more frequently, eventually not even requesting their exclusion. These days, in stark difference to my younger years, I love a good tomato. There was never any satori-esque revelation of eating that first real tomato for me, nor am I really even sure when I started liking them. I imagine it must have been shortly after I graduated from college, and may have involved a certain guy who claimed to “eat them like apples”. Whatever the reason, I am now a sucker for the sweet acidity of a juicy summer tomato. Not so much a devotée of the cooked tomato, I think there’s hardly anything better than a crisp, raw tomato, full of bright flavor that never lasts quite as long as you’d like. Until now, that is. Catching up on some (very) old magazines, I recently drooled over Molly Wizenberg’s article in last September’s issue of Bon Appétit. In it, she paints her usual and stunning image, this time of the pomodori al forno from Café Lago in Seattle. She speaks of begging for the recipe. She speaks of overhearing a man claim it’s “the best appetizer in Seattle”, these humble plum tomatoes, roasted low and slow with olive oil and oregano, then layered with garlic and parsley. For a girl like Molly, and for a food town like Seattle, that’s awfully big talk, especially about such a humble dish. I had to try it. This week’s theme was the perfect excuse to try a batch out, since I had already penciled in a tomato-basil combination. I was dreading any monstrosity involving raw tomatoes, which would just turn to liquidy goo inside a loaf of baking bread, and hated to resort to leathery sun-dried tomatoes. Besides, tomatoes are definitely in season right now; I had no reason not to try the recipe. Fortunately, it made more than enough roasted tomato for the bread, leaving plenty left over to provide fodder for my overactive culinary imagination. It’s a good thing, too – they’re just as amazing as promised. Soft without ever turning mushy, intense without ever overpowering, these are the best cooked tomatoes I think I’ve ever had. In the soft heat of the oven, hey somehow pull into themselves, intensifying their essence, and flavor the olive oil at the same time. They’re gorgeous. 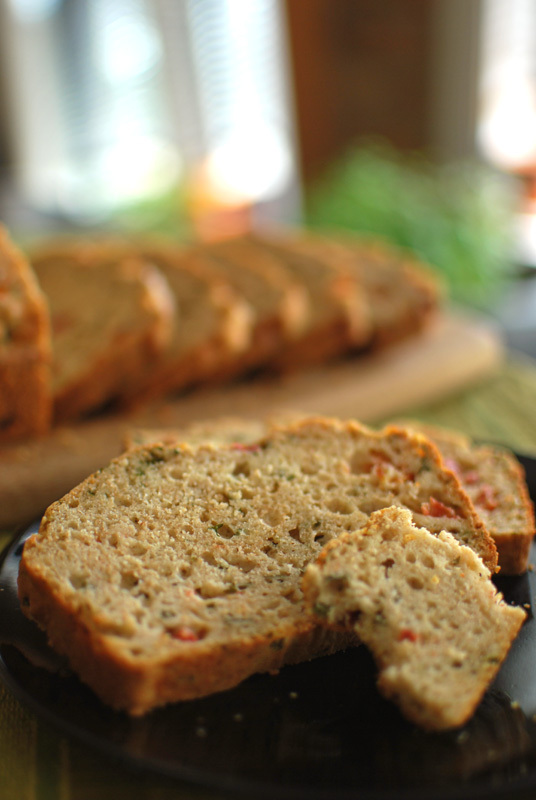 Thinking that the moisture-rich tomatoes would weigh down a yeast bread, I opted to include them in a savory quick bread, brightened with the flavor of fresh basil. I used a bit of whole wheat flour to lend a rustic characteristic to the bread, to complement the homey tomatoes, and to give a little more hearty support. The oil used in the bread is the olive oil used to roast the tomatoes, adding an extra level of flavor throughout every bite. While baking and cooling, the bread smelled nothing short of heavenly. A mixture of slow-roasted tomato, basil, and fresh bread filled the kitchen, making it very difficult to wait out the required cooling period. When sliced, the tomatoes dotted each piece in a lovely mosaic. And the taste! Lightly grainy, it was fresh with basil, but overall the flavor was of rich, full tomato, the sort of depth you know that has taken no shortcuts. The interior was soft, with a pleasant crunch to the crust surrounding it. It was just as I hoped it would be, and it was delicious. This is not the fastest “quick bread” to make, considering the 2 to 3 hours needed for roasting the tomatoes; and you could easily take the shortcut of using oil-packed sun-dried tomatoes instead. But then there’d be no leftover roasted tomatoes hanging about your kitchen, and that, Gentle Reader, would be the real tragedy. Take it from a tomato-lover who knows. 1. To roast tomatoes, preheat oven to 250° F. Pour 1/2 cup olive oil into a 13 x 9 x 2 inch glass or ceramic baking dish. Place the tomatoes in the dish, cut side up. Drizzle with the remaining 1/2 cup olive oil, and sprinkle evenly with oregano, sugar, and salt. Bake, uncovered, for 1 hour. 2. Using tongs, gently turn the tomatoes over. Bake 1 hour longer. Turn tomatoes over again, and bake until they are deep red and very tender, about 15 to 45 minutes more, depending on the ripeness of the tomatoes. Remove from oven. 3. Gently turn tomatoes over again, and pull off skins, which should slide off easily. Discard the skins. Layer the tomatoes in non-reactive medium-sized bowl, sprinkling garlic and parsley over each layer. Drizzle the tomatoes with the oil left in the baking dish, until fully covered. Cover loosely, and let stand at room temperature for 2 hours. At this point, cover tightly and chill up to 5 days. 4. Position a rack in the lower third of the oven. Preheat the oven to 350º F, and grease an 9 x 5 inch loaf pan. 5. In a large bowl, whisk together the flours, baking powder, salt, and basil. Set aside. In a liquid measuring cup, mix eggs, milk, and olive oil (from the roasted tomatoes) together to blend. Coarsely chop 5 of the roasted tomato halves. 6. Add the milk mixture to the flour mixture, and fold until about three-quarters of the dry ingredients are moistened. Add the tomatoes, and fold just until the pieces are distributed and the dry ingredients are moistened; the batter may be stiff. 7. Scrape the batter into the prepared pan and spread evenly. Bake until a skewer inserted in the center comes out clean, about 45 minutes, or until golden brown. Let cool in the pan on a rack for 5 to 10 minutes before removing from the pan to cool completely on the rack. 1. A note from Molly W.: If you’re making the roasted tomatoes outside the height of tomato season, use best-quality canned, such as Alta Cucina, Muir Glen, or Hunt’s. 2. You will not use all the roasted tomatoes for this recipe, leaving plenty left over for tossing with pasta, or serving with bruschetta. Bring tomatoes only to room temperature before serving as an appetizer, leaving oil in the refrigerator. 3. A word on botulism: while botulism poisoning is rare, storing whole cloves of garlic in oil at room temperature is a good way to grow the botulinum toxin. Please do not store the roasted tomatoes at room temperature! I do, however, consider this recipe safe if the following precautions are taken: 1) that the garlic is chopped into very small pieces (reducing the habitat for any toxin that may be present), 2) that the mixture is stored in the refrigerator, and 3) that it is consumed within 1 to 2 weeks. Considering that the toxin does not grow well at pH levels below 4.6, and that tomatoes are consistently around 4.0 to 4.11 on the pH scale, I feel that the tomatoes help by increasing the acidity of the mixture. If you are very concerned, or would be feeding this to very small children or elderly people (whose immune systems may be compromised), you can use garlic powder instead of fresh garlic. Alternatively, chopped or whole cloves of garlic may be roasted with the tomatoes, to flavor the oil, then strained out and discarded (or eaten immediately) before storing the tomatoes. For fairly thorough discussion on botulism, garlic, oil, and the risks involved, see this link. Bergamot: if you try nothing else, at least try the tomatoes! They were just wonderful! The bread was a hit recently at a picnic, so I can definitely vouch for it’s success too.